An equally historic crossing of the Edmund Pettus Bridge, 50 years later. Every once in a while, someone utters a phrase or asks a question that jolts you into reality. And, we hope, into action. 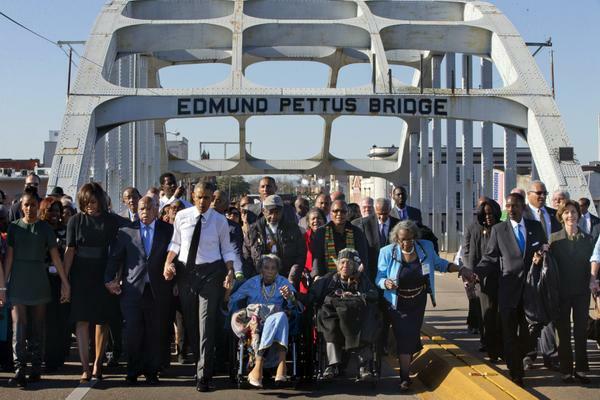 President Obama’s speech on the 50th anniversary of the “Bloody Sunday” march across the Edmund Pettus Bridge in Selma, Ala., was an eloquent and stirring tribute to what is best about America. It’s already being called his “I have a dream” speech, and deservedly so. But anyone who listened to it (and if you haven’t, watch and listen to it online, or read the transcript; it’s more than worth your time) knows that besides praising those who paved the way and paid the price in blood for the passage of the Voting Rights Act, Obama asked America for something more. He asked us all to vote. What is our excuse today for not voting? Rep. John Lewis (D-Ga.) literally got his skull cracked 50 years ago as he tried to cross that bridge 50 years ago in a protest against voting restrictions. He’s a reason to vote. James Chaney, Andrew Goodman, and Michael Schwerner were the three young men killed by KKK members in the summer of 1964 in Mississippi because they dared to put African-Americans on the voting rolls. They’re also a reason to vote. And there are so, so many others. Voting is our right, our privilege, and our responsibility. Today, in the United States, that seems more important than ever. Consider the pitiful voter turnout rate of 36 percent in the 2014 election. Nearly two-thirds of the country stayed home on Election Day, and yet, people still complain about the outcome. With bigger GOP majorities in both houses, Congress seems even less able to function. 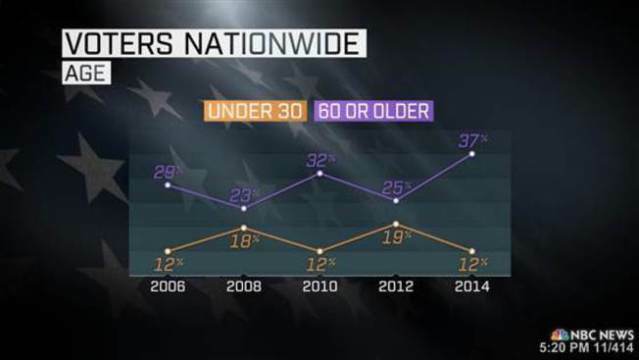 And consider the turnout of the nation’s youngest voters in the 2014 election as a percentage of the electorate. Yet another 12 percent figure. As Obama correctly pointed out, countries all over the world have much higher voting rates than the U.S. Even with the relatively high turnout in the 2008 election, with a rate of more than 60 percent, the United States still ranked 59th in voter turnout that year. In mid-term elections, the rate averages closer to 40 percent. “We know the march is not yet over,” Obama told the thousands gathered at the historic bridge and the millions listening to his landmark speech on television. Nope, not over. Next election day, get your butts to your local polling place.